The Riviera Nayarit’s Glamour Peninsula continues to position itself as home to Punta Mita, the most exclusive development in Mexico; the celebrity stayed at The St. Regis Punta Mita Resort. Top trending celebrities continue to choose the Riviera Nayarit as their favorite vacation hotspot. Most recently it was Oscar-winner Jennifer Lawrence who chose Mexico’s Pacific Treasure to enjoy a weekend accompanied by her friends. 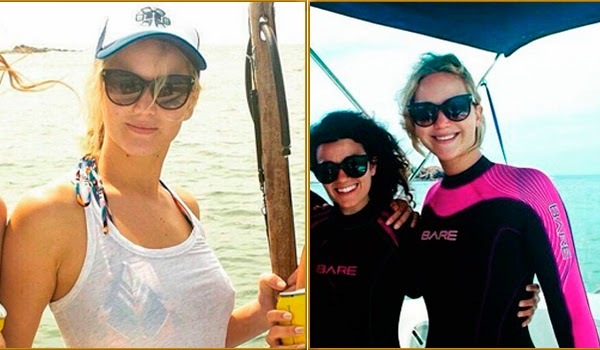 The star of The Hunger Games saga enjoyed a few days of fun in the sun—she even took in some underwater fishing with Spearmex in the waters surrounding Punta de Mita. According to what she published on social media the purpose of the trip was to celebrate a friend’s birthday. Punta Mita continues to draw the top-grossing stars from around the globe, maintaining its status as the most exclusive tourism development in Mexico from its location on the Riviera Nayarit’s Glamour Peninsula. Jennifer Lawrence and her friends were pampered for the weekend at The St. Regis Punta Mita Resort, named one of the best hotels in the world by the specialists at TripAdvisor, Travel+Leisure and Condé Nast Traveller, among others. Jennifer Lawrence has over 12 million followers on Facebook alone and there’s no doubting the media reach of this young silver screen siren. Just a few days after she left the Web has been bubbling over with news of her stay in the Riviera Nayarit, which means plenty of implied publicity for the destination. The fact that celebrities are flocking to the Destination is a testament to the promotion given to its attractions; their presence on the coast of Nayarit continues to amplify its positioning on the world stage, one of the main objectives of the Riviera Nayarit Convention and Visitors Bureau.